Najah Bazzy travels the world conducting training at government agencies and Fortune 500 companies, but she always looks forward to visiting St. Scholastica. "It's a very loving environment and you feel it, which I can't say is true everywhere you go," Bazzy said. During her latest visit in April, she found yet another reason to love the College. 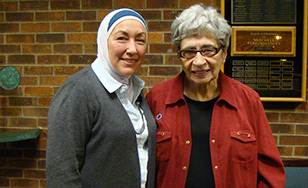 On campus as a guest of the Oreck Alpern Interreligious Forum, Bazzy was staying at the St. Scholastica Monastery. The day she arrived, she stepped off the elevator near her room and was amazed to see a familiar yet completely unexpected face. It was Sister Beverly Horn '54, one of the leading proponents of the transcultural nursing model on which Bazzy has based her career. Horn was a mentor to Bazzy, who had no idea her colleague happened to live at the St. Scholastica Monastery. "I was just putting a note on her door. She got off the elevator, and I was right there," Horn said. "I think she was shocked." They met 15 years ago at Madonna University in Livonia, MI, the headquarters of Madeleine Leininger's famous "Sunrise Model" for Transcultural Nursing. The model lays out compassionate ways for health care providers to overcome barriers that can emerge between religious and cultural traditions and critical medical procedures. "It gives us a way to approach life," Bazzy said. On campus she spoke about the work of the non-profit organization she founded, Zaman International, and discussed ethical issues in several nursing and social work classes.